Hello there! 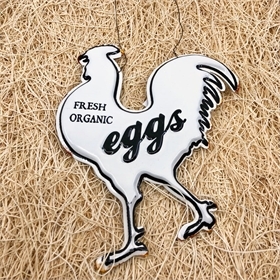 This attractive, enameled tin ornament is large enough to be used as a door hanger or wall art! Classic colors and design exemplify the simple farmhouse décor we all love. Made of painted, galvanized metal. Wire hanger included for easy mounting.